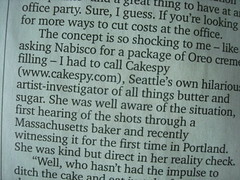 Cake Byte: Frosting Shots Article in the Seattle P-I! Extra! Extra! 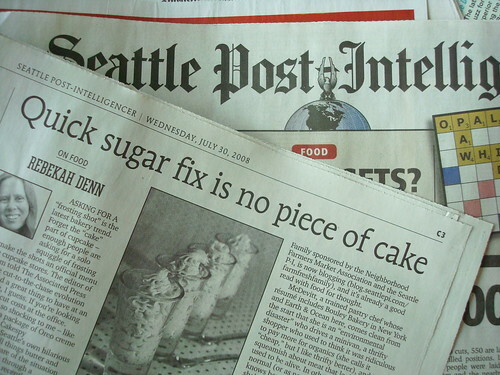 Breaking Cake News! Asking for a "frosting shot" is the latest bakery trend. Forget the "cake" part of cupcake – enough people are asking for a solo squiggle of frosting in a cup to make the shots an official menu item at some cupcake stores. The editor of Epicurious.com told The Associated Press it's "kind of the cut-to-the-chase evolution of cupcakes" and a great thing to have at an office party. Sure, I guess. If you're looking for more ways to cut costs at the office. And of course, it begs the question--what do you think of frosting shots?